I viewed this film at the Leeds International Film Festival and then on its British release in December 2017. I have waited to post on the film as I have been trying to resolve a puzzle. The title failed to achieve an entry in the Sight & Sound ‘Top 40 Films of 2017’. This despite the ludicrous Mother achieving equal 19; several productions that were not actually cinema films; and the beautifully undramatic Call Me By Your Name. I did wonder if the oddity of the S&S list coming out at the beginning of December was the reason? Solving the conundrum proved difficult. The complete lists of voters and votes is actually on the S&S webpages but it was beyond my limited computer skills to crack it. After some delays I managed to get the information from the S&S editorial office. It appears that Michael Haneke’s new film received only one vote, by Geoff Andrews. I shall include him in my top five film critics of the year. “In what has to be considered a minor upset by Cannes standards, Happy End was the first Michael Haneke joint to leave the festival without a major prize since 2003 …” [this use of ‘joint’ is new to me]. It is a typical Haneke film. Perhaps critics felt a sense of déjà vu as they watch the familiar characters, situations and events. I did think it is not in the same class as Amour (2012) or Caché / Hidden (2005). But it is very funny, more so than the recent Haneke productions; certainly as effectively as the 1997 Funny Games. This is a sardonic and satirical examination of the French bourgeoisie whilst at the same time drawing attention to the exploitation and oppression that their wealth and success entails. The setting for most of the film is the area around Calais where the central family live and have their business. The plot presents aspects of that but most of the running time is concerned with the interaction within the family. However, at key points in the narrative there are important scenes involving members of the working class, members of the servant class and the unemployed migrants in the area. The latter are presumable waiting to try and cross the channel to join the British audiences of the film. Actually Amour does not provide the surname of Georges. Though the death of the wives are similar the point is that one is a retired piano teacher, miles away from the bourgeois owner of a substantial construction company. The film opens with a series of shots taken on a mobile phone, first of a woman washing and toileting, then of the family pet. These are accompanied by text messages which seem inconsequential but require close attention. These shots set up one strand in the film dealing with modern electronic gadgets. Later we see a series of what I take to be texts messages on a laptop. Some of these are extremely funny. Then at the end of the film we return to the mobile phone; this sequence is noted for provoking audible responses in the audiences; I found it exhilarating. The opening is followed by a long shot/long take , in typical Haneke fashion., of a Laurent construction site. The event here will create repercussion right throughout the film. Between these very personal and these very public sequences we see the family politely destroying each other. These interactions fall between expensive rituals like parties and meals. And both types are disrupted by the people from ‘across the tracks’ . Thus whilst Haneke’s representation of the family is sardonic the film also presents the critical alternative worlds as was the case in Caché. The film is scripted and directed by Michael Haneke. As usual it has a beautifully realised style with fine production design and cinematography by Oliver Radot and Christian Berger respectively. And the editing by Monika Willi is unshowy but very effective; and equally so is the sound. So, perhaps given that the film received a December release and that S&S continue their odd practice of publishing issues in the month preceding the titular date, we could see this fine film in the 2018 ‘top forty’. World Cinema lost one of it luminaries in October this year when the iconic career of this filmmaker came to an end. Wajda was one of the celebrated graduates of the Łódź Film School. This training ground for film actors as well as crafts people had a deservedly outstanding reputation. Wajda first drew attention with his trilogy A Generation (Pokolenie, 1954), Kanał (1956) and Ashes and Diamonds (Popiół i diament 1958). These were founding works in what developed into the European art cinema. I saw them, as did many at the time, in a Film Society in 16 mm prints. I have since been able to revisit them again in 35mm prints. All remaining outstanding but the key film is Ashes and Diamonds with the character of Maciek played by the young iconic Polish actor Zbigniew Cybulski. There is a terrific sequence with fireworks lighting up the sky and a sequence which I have seen copied a number of times with sheets billowing from a clothesline. Wajda turned out fine films decade after decade, and I still have to see a number of them. One that stood out was Landscape After the Battle (Krajobraz po bitwie, 1970), a film that deals with a Holocaust survivor and which includes some stunning exterior sequences. Two other memorable films that addressed the repressive regime that ran Poland in the 1960s and 1970s are Man of Marble (Człowiek z marmuru, 1977) and Man of Iron (Człowiek z żelaza, 1981). I saw at least one of them at the Academy Cinema in London, a fine but now lost venue for quality film. More recently Katyń (2007), dealing with the Soviet massacre of Polish Officers in 1941, was extremely well done. I was able to catch The Promised Land (Ziemia obiecana, 1975) as part of the programme ‘Martin Scorsese Presents: Masterpieces of Polish Cinema’. It was screened at the Sheffield Showroom in a good quality 35mm print. The film chronicled the development of the C19th capitalist textile firms in Łódź. There narrative was fascinating as were the characters and it included many fine sequences, one being an impressive factory fire. We can still look forward to his final film Afterimage ( Powidoki, 2016), though it does not yet have a UK release date. I haven’t seen writer-director Ruben Östlund’s Force Majeure (Sweden-France-Norway-Denmark 2014), one of the most feted arthouse films of this year, but my anticipation has increased after watching (experiencing?) the film which preceded it, his second feature. There are at least two levels of ‘play’ going on in the film: there’s the ‘play’ of the boys (though it’s actually bullying rather than the ‘innocent’ kind); and the play with the spectator’s head, which makes for an interesting, and sometimes uncomfortable, experience. 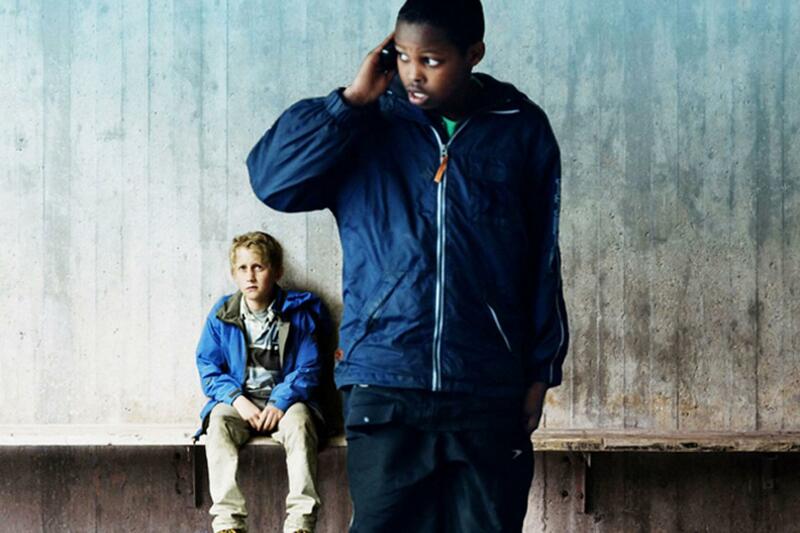 Based on actual court cases in Gothenburg, Sweden, the film follows a group of black lads as they part con/part bully two white, and one lad of East Asian extraction, out of their stuff. The racial politics could, in the eyes of the ‘wrong’ (racist) audience, be quite incendiary as the film represents the black lads in a (negative) stereotypical way. As an arthouse film (in both Sweden and elsewhere given the film’s visual style – more below), however, we might expect it to be seen by the ‘right’ (middle class) audience who may be appalled by the racist stereotyping presented. However, it all happened so it’s not racist is it? These questions might give you some idea of the way Östlund teases (plays) his audience. It’s a bit like near the start of Crash (US, 2004), where two African-Americans talk about negative stereotyping before robbing two middle class white people on the street. It’s shocking to see obvious racist stereotypes in modern cinema (there are plenty of non-obvious ones). Östlund, who co-wrote and directed, doesn’t offer the emotional catharsis of entertainment, which we get in Crash, but the unnerving camera eye, most commonly utilised by Michael Haneke, with which to observe events. The film virtually forces us to ask the question whether we are watching a racist film or not; it is a good question. The camera is mostly still, with some pans, and uses long takes and long lenses to observe the action from a distance, which often appears to be taking place on location with passers-by oblivious to the filming. This ‘dispassionate’ distance puts us in the position of an onlooker who can only observe and not intervene. Very little intervention from passers-by actually goes on. In one scene, where the black gang beat up one of their own members, a man who saw what was going on tells the victim he’ll be a witness in court for him. While this scene is obviously completely staged (please let it be! ), it’s still shocking to think people won’t get involved; though the passivity of people, when confronted with problems on the street, is well documented. Östlund does not simply ‘have it in’ for the gang, as a coda the dads of the white lads take out their revenge in a quite outrageous way; presumably this too happened. Two women do intervene at this but didn’t call the police!!! Sorry for the exclamation marks but that’s how the film works: ‘call the police!’ was bellowing in my head. Assuming it all happened, an absolutely key issue for if it hadn’t then the film would be read differently, Play brilliantly questions our morality. The Telegraph reviewer, who gave the film 5*s, felt the film was ‘partly about a kind of paralysis wreaked by political correctness’. That’s to be expected from a right wing newspaper that doesn’t understand that ‘political correctness’ is a term of abuse aimed at attempts to avoid discrimination. For me the film’s about voyeurism and interrogates our values; or rather encourages us to interrogate our values. And I don’t think the film is about race, rather it is suggesting that class is the key social factor. The gang have little, compared to their middle class victims, who we first see shopping in an anonymous mall; one of whom has just lost 500 kroner to no great distress. Their parents, barely seen, seem more interested in work and only belatedly respond to a distress call. In a materialist society, materialism is the source of conflict. Östlund doesn’t take sides he just shows us uncomfortable truths. A mostly non-professional cast are brilliantly marshalled though I am still puzzled by the scenes on a train with a cradle which seems to show up near the end, but the point is lost on me. Enlightenment welcome in the comments below please. What is Curzon up to? The Renoir in its guise as an art cinema in 2008. Two French films playing across two screens with a music documentary also in the programme. There is a great deal happening in in the global film industry, most obviously in China and in the responses to Chinese developments seen in Hollywood. In the UK, while we are affected by those developments, there are also specific issues concerning local production, distribution and exhibition. In this post I want to focus on just one company – but what it is doing has wider implications for the rest of the industry. ‘Curzon’ (or more properly, ‘Curzon World’), is the brand name for a company which is now a significant player in UK distribution and exhibition. Its current operation is the result of the merger between what was once two separate companies, the distributor Artificial Eye founded by Andi and Pam Engel in 1976 and the Curzon cinema group named after the original Curzon cinema in Mayfair that first opened in 1934. Artificial Eye had itself acquired a mini-chain of art cinemas in Central London comprising the Renoir and the Chelsea Cinema, both taken over in the 1980s and the Lumière (closed in 1997). Access to these three cinemas, all in prime positions, enabled an art cinema distributor to ensure that their titles would get time on a first run to establish a profile before moving to VHS and later DVD releases. In 2006 Artificial Eye, for some time the leading distributor of art cinema in the UK, merged with Curzon adding the most prestigious art screen in Mayfair and the most influential (the three screen Curzon Soho) to the two Artificial Eye venues. Immediately, the newly-merged company had a total of 9 screens in London (the tiny Curzon Richmond was formerly owned by Philip Knatchbull, now the CEO of Curzon). This meant that Curzon became an important gatekeeper for art cinema in the UK since specialised films are dependent on a strong London opening and no other exhibitor could match the Curzon screens in terms of Central London location. However, Curzon’s future expansion was still hampered by its lack of screens outside London where City Screen/Picturehouse was starting to develop a lucrative chain in university towns and other middle-class centres. 2. ‘Partnership’ schemes have seen Curzon take on the programming of existing cinemas and part-time cinemas in various arts centres in West Sussex, Devon and Aberdeenshire as well as at Mondrian (Southwark), Soho (Ham Yard Hotel), Pinewood Studios and a digital initiative with HMV at their Wimbledon store. Curzon also books films and shares events with Cornerhouse in Manchester (but doesn’t programme directly). It is also seeking new partners for its ‘Curzon Connect’ scheme which offers programming and the Curzon ‘brand’ to part-time operators. Digital distribution and the increasing range of ‘live’ opera, theatre, ballet and art exhibitions makes small cinemas more viable in country towns with wealthy middle-class populations. 3. Curzon has become an online exhibitor – VOD rental – as a complementary activity to its DVD and cinema operation. Artificial Eye’s films are available online as soon as they are in cinemas, the justification for closing this distribution ‘window’ being that audiences who live far from a Curzon cinema will still be able to see new films during the initial promotional period when the title’s profile is still high. The latest Curzon expansion sees the re-opening of one of its original properties, the Renoir in Bloomsbury on March 27 as ‘Curzon Bloomsbury’. The extensively re-designed cinema will have 6 screens (4 with 30 screens or less, 1 with 55 and 1 with 139). When the cinema was first opened in 1972 it had a single screen seating 490, before twinning in the late 1970s. I’ve known the cinema across all its incarnations and I suspect it will remain the ‘Renoir’ for me. It’s importance is that it looks as if Curzon intend it to be their prime site for foreign language films (or, more likely, the main support to the larger Curzon Soho, now seemingly threatened by Crossrail developments). The new Bloomsbury will open with a festival of ‘Auteur cinema’ and one of the first releases to feature on a long run will be Roy Andersson’s Venice-winner A Pigeon Sat on a Branch Reflecting on Existence. The 55 seat screen (named ‘Bertha DocHouse) offers conference facilities and is intended to be a ‘home’ for documentary features. The Bloomsbury will bring Curzon’s full-time screen count up to 27, 18 of which are in London. However, it looks as if no more than 10 of these screens will regularly programme foreign language cinema – or indeed English language ‘art cinema’. Curzon is the best of the three major specialised cinema chains in terms of subtitled films, but in its new cinemas it is clear that mainstream films and live events are the main part of the programme. On my trawl through Curzon’s 21 screens today I found not a single subtitled film playing. Screens are dominated by Still Alice, Second Best Marigold Hotel and X+Y, none of which are ‘art films’. How on earth can distributors of foreign language and art cinema expect to build a profile for their titles when the most important exhibitor in London for their product behaves in this way? The other major disturbing feature of the new Curzon operation is its focus almost exclusively on the wealthy white middle-class market. The emphasis is on small luxurious screens, bars and restaurants and very high ticket prices. It will be interesting to see the new Bloomsbury prices. The screen sizes in some of the new cinemas are around 40-50 seats and in Curzon Victoria a ‘peak’ time ticket will cost you £15 or £18 for a ‘Pullman’ seat. Working people in London can perhaps afford these prices. But how about Curzon Sheffield where the equivalent ticket is £11.50? This is almost twice the price of the smaller independent cinemas in Yorkshire. At least in Sheffield there is a choice (The Showroom price is £8.10) but in Ripon, the Curzon is the first cinema in the town for some time. This new era of specialised cinema is not for the likes of me – I enjoy lower prices and a nice cup of tea at several venues. Curzon are changing the face of specialised cinema alongside the other two chains Picturehouse and Everyman. We’ll try to look at them soon. Abbas Kiarostami shoots his subjects tangentially; that is, he doesn’t necessarily place the camera in the obvious position to tell the narrative. Behzad Dorani plays the ‘engineer’, which is what the villagers in a remote location of Iran think he is, and we come to know the place through his observations. On a couple of occasions Kiarostami’s favoured long take simply focuses, from the position of the mirror, on the engineer shaving. The narrative, at this point, is carried by his conversations with the rest of his film crew; they are in the village to secretly film an ancient sacrament. Similarly, the opening sequence watches them arrive (see above) in extreme long shot, with the telephoto lens flattening the landscape; it makes strange what we recognise. We here the men in car trying to navigate via agrarian directions such as ‘turn left at the big tree’. Dorani, by the way, according to imdb, has only appeared in one other feature, which is remarkable given how brilliant he is in carrying this film. For much of the film we are not clear what the protagonist is after; he seems to be waiting for someone to die. He spends his time wandering the village and, increasingly hilariously, rushing up the mountain to get a mobile signal. Not a lot is happening in a village where not a lot ever happens; except it does. The film covers birth, life, marriage, death, friendship, education, childhood. All of life in an exotic location is there for the spectator and it is beautifully shot; the colours are quite stunning, both the village, and its surroundings, occasional look like an Impressionist painting. Making films in Iran is difficult unless they are treading the party line. 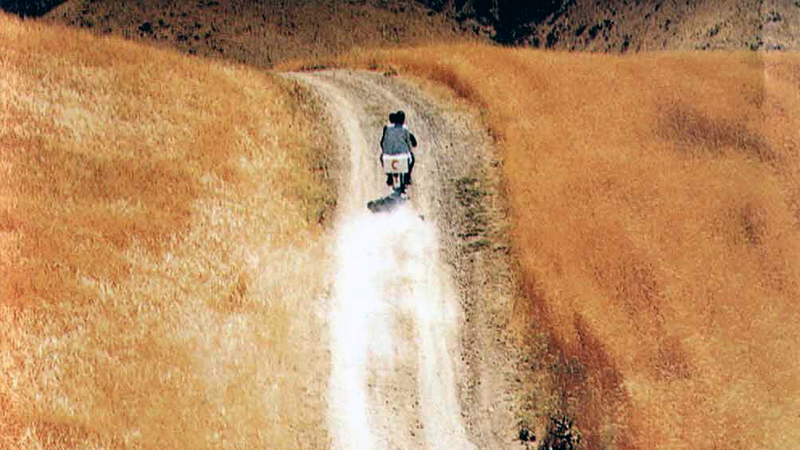 Kiarostami’s success, and this film won the Palme d’Or, is rooted in his ability to appeal to the western art house audience. There is a slightly uneasy opposition set up in the film between the ‘town’ (the ‘engineer’ is from Tehran) and the apparently simple ‘country’ of the village. Despite the fact the film-maker is indigenous I think we are still being offered an ‘orientalist’ portrayal of a society we know very little of. The place is portrayed extremely sympathetically but we are no more than tourists. To be fair to Kiarostami, he probably feels that way too. Hence the village is ‘strange’ to my western eyes and is shot in a strange (arty) way; but what we learn is that, essentially, the strange is very much the same. It might not be the same, though, I cannot tell from the film. Whilst studying Film/Literature, at Warwick University in the early 1980s, we had an opportunity to see, in 16mm, Laura Mulvey and Peter Wollen’s Riddles of the Sphinx and I vividly remember one shot from the film and that I liked it. Now the BFI have re-released the film, along with Penthesilea: Queen of the Amazons made by the wife-husband pair three years earlier, in a dual format edition. So here’s a great opportunity to revisit the fertile time of the ’70s when Marxist politics were to fore. Not that Marx has been shown to be wrong, or irrelevant, of course just that he has seemed to have gone out of ‘fashion’ in academia (I observe that as an outsider so may be wrong). I notice that economics students in Manchester are campaigning to get Marx back on their curriculum; it’s remarkable that he’s not especially in the light of the free-market driven financial collapse. I got Riddles on rental but, as I liked the film again and the package was so generous, including a booklet, that I’ve bought the er ‘limited edition’ (I believe that refers to the Blu-ray disc). What’s particularly interesting is how the film now as much an historical document showing, as it does, slices (or rather ’round bits’) of life from the ’70s. The ’round bits’ refers to the bulk of the film that has six (I think) scenes where a rostrum camera pans slowly as the action happens in front of it. What’s seen appears to be controlled as much by the technology as the directors; the framing isn’t aesthetically pleasing and so draws attention to the material nature of what we’re seeing. As does a sequence where we see the very grainy footage of an old film of Egyptian monuments (the only passage of the film that tested by patience). The film’s not just ‘historical’ in what it shows but also in how it shows it utilising modernist techniques to ‘estrange’ the spectator. The narrative follows the life of a mother, whose husband (probably not ‘just’ a partner in the ’70s) has left her with their young daughter. Each ‘slice’ focuses on a different event such as starting work, socialising in the work canteen and shopping. The latter slice, in an early version of the late capitalist hell, shopping malls, is particularly interesting to look at. These are mundane events, the antithesis of Hollywood, but integral to our lives and, particularly, the lives of women. Mulvey and Wollen are better known as film theorists than film-makers and theirs was a fascinating project to turn theory, particularly the ‘male gaze’ and ‘counter cinema’ respectively, into film. The ’70s were a fertile time for such experimentation and it was good to see the BFI, which funded this film, recently backing the intellectually adventurous Stuart Hall Project. With feminism making a long-needed comeback, Hollywood giving up on thought-provoking cinema, the time is right for new ways of creating meaning in film. The shot I remembered over 30-years later, by the way, was when the stately pan suddenly began moving on top of a vehicle. I managed to miss all Leos Carax’s 90s films, not intentionally, so my bafflement with Holy Motors wasn’t surprising as it’s a personal reflection upon cinema. I didn’t even realise that Carax was playing the character in an early scene who opens a door, disguised as a hotel wall, with a finger that is part-key. On the other side there is a cinema packed with an audience. This audience is the first thing we see in the film; I think they all had their eyes closed (Philip French says they are dead). They appear to be (not) watching an early scientific film by Eitenne-Jules Marey. The debt to David Lynch of ‘Carax’ ‘s hotel room is rooting us clearly in surreal cinema. We meet Alex (Denis Levant, who always plays an Alex in Carax’s films) who goes from appointment to appointment, in a limousine, playing different roles, which appear to be real. But we know they aren’t because we are watching a film…but are they meant to be real in the film? Maybe some of them are but probably not. Irritated by this? Don’t watch it! I clued into Holy Motors being about cinema, as Alex finds himself in different genres, and the film certainly fulfills the surrealist imperative to annoy. It’s supremely arthouse, as your brain needs to be switched on, and includes visually dazzling sequences; particularly the green screen special effects scene when the characters are dressed for motion capture. It doesn’t all work, the ‘merde’ character is particularly annoying, but there are more ‘hits’ than ‘misses’; Levant, however, is terrific throughout. I also enjoyed Kylie Minogue’s cameo as a gamine Jean Seberg figure shot in an abandoned apartment store the looked like it belonged in Blade Runner with its grandiose architecture and mannikin parts strewn around. Edith Scob, from Franju’s Eyes Without a Face (1960), plays Alex’s impossibly slim and elegant chauffeur… The references go on… and on. Postmodern fluff or more than the sum of its playful parts? The final scene is truly absurd (I thought wonderful) and I’m sure it enraged many who were annoyed by the film. I’m not sure whether this is a profound film, a silly film, or neither; I need to see it again but I think, if I had caught the film in the cinema, it would have gotten into my 2012 top ten. Sight & Sound‘s October issue has plenty of useful contextualisation. The recent release of What Richard Did by Lenny Abrahamson (reviewed here) has prompted me to go back to look at his earlier release from 2007. Both this and his 2004 first feature Adam and Paul were on my radar but I hadn’t found time to watch them. I’m glad now that I finally made the effort. Garage is set in an unnamed small town in rural Ireland (it seems to have been shot in several different parts of the country, but mainly in the ‘West Midlands’) and its central character is Josie (Pat Shortt), a 40 year-old man who ‘runs’ filling station/garage situated outside a small town on the main road. In reality he is mainly the caretaker as business is slack and we never see Josie actually serve anyone. He’s employed by one of his old schoolmates who is now an entrepreneur in the town and he lives a fairly solitary life, bedding down in a backroom of the garage. Josie is considered as a little ‘slow’ by the local community – but he is cheerful and friendly and most of the locals don’t make fun of him or abuse his trust. The one lout who does bully him in the bar is the exception. Josie’s life begins to change when his boss decides that there is more passing trade and that the garage should stay open longer. Consequently Josie is joined by an ‘assistant’, a shy and gawky 15 year-old, David. Well-played by Ryan O’Connor, David is a ‘blow-in’ to the small community and therefore initially an ‘outsider’ like Josie in social terms. He’s intelligent and sometimes a bit spiky – a ‘normal’ adolescent – but he gets on with Josie and they become friends. This friendship leads Josie into contacts with the other local teens and perhaps makes him reflect on his loneliness. Indirectly, David’s presence will lead to a series of tragic events. My first thoughts about the film were that this was a low-budget European art film. There are no genre indications as such except towards the setting of the small town and its possibilities for drama. The town and the handful of local inhabitants are presented in a realist manner and my thoughts turned towards the Dardenne Brothers – but Garage doesn’t have quite the same intensity. A review I read mentioned Bresson. There is gentle humour in the initial representation of Josie’s mundane daily rituals and his contact with various characters. There is also a sense of the relative tranquility of rural Ireland and the potential for some kind of magic in the evening light – although the skies that Josie so enjoys seemed foreboding to me with their scudding clouds. Gradually however, we realise that happy though Josie appears to be in his own little world, he still seeks the possibility of intimacy in a relationship. Eventually too, we realise that Abrahamson is using Peter Robertson’s beautiful cinematography to compose shots very carefully and to look for various forms of symbolism in the mise en scène. The film is slow and nearly always calm. Pat Shortt’s performance is exceptional. He was first a comedian specialising in physical comedy and he uses the skills of a physical comedian to create a distinctive gait for his character, as well as an appropriate voice. His performance also has a resonance since he is well-known in Ireland for a comedy series set in the same kind of location as that in Garage. I’m not sure I would use that term to describe a character in a contemporary drama. Of course, I know what he means but it does raise what might be the uncomfortable question at the centre of the film. If this is a realist depiction of Irish rural life, it suggests that there is no modern infrastructure to replace the traditional village community in what is usually seen as one of the more affluent and ‘developed’ societies in Europe. On the other hand, as events transpire, we might argue that the ‘regulation’ of contemporary society is what really makes Josie suffer – that and economic developments. The town’s residents who know Josie and tolerate him don’t really listen to him or help him with his problems. They are just glad that he seems happy. I was interested to read the range of IMDb comments. They include many Irish commentators, but also other Europeans. While most clearly liked the film and thought it praiseworthy, there are a couple of gainsayers, including one who argues that it isn’t a very good representation of a character with mild learning difficulties and another who argues that the residents are too morose and that the rural Irish are more likely to moan and get angry about their lot. These are fair points but as an arthouse film Garage works very well. The excellent production is enhanced by the presence of George Costigan in a small but vital role and Anne-Marie Duff as Carmel (who could probably act as a focus for another story). I can see why the film won one of the Cannes prizes and why Abrahamson and his collaborators are seen as one of Ireland’s most important filmmaking teams.